This year TA-XAN AG and T.A. Distribution S.A.M. once again sponsor the Monte-Carlo Masters. 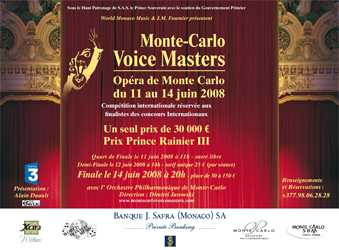 This renown classical music competition held annually in the Salle Garnier of the Monte-Carlo Opera attracts musicians of international standing who have already won prizes as pianists, violinists or lyric artists. The intermission during the finale of this year's Voice Masters competition will provide the perfect opportunity to enjoy a glass of XAN Wellness, a refreshing soft drink, full of vitamins and enriched in xanthohumol. This active component of hops will ensure that on this occasion you can pamper both your mind and your body.